A fascinating look at five decades of Amway's innovation Amway started in 1959 as a way for people to earn extra money selling soap and cosmetics. Today, it has recaptured the public's attention largely because of an extensive print and broadcast campaign featuring the Quixtar name-with ads saying "you know us as Amway." 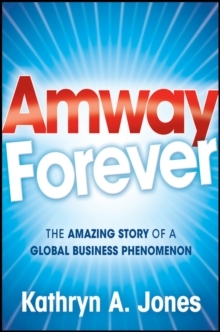 Amway Forever chronicles the amazing inside story of this global business phenomenon. Page by page, it explores the history of Amway and its remarkable resurgence around the world. From how the company began and its growing pains in the 70's and 80's to its recent online revival, this book explores how Amway has survived and thrived over the past fifty years. * Delves into how innovation has led to Amway's growth into an international powerhouse * Reveals Amway's pioneering marketing tactics and sales strategies * Offers an historic perspective, as well as a contemporary look, at how the company has evolved Engaging and informative, Amway Forever is a must-read for anyone interested in this company's unique business model and buzzworthy emergence into a global success.